Chris Henry’s paintings tell a story; they are mysterious, challenging and as diverse as the collectors who own them. He can be trusted to always offer art that is unique, textural and intriguing. Bringing a well-seasoned life experience to the easel, he knows that paint is a form of language and he uses this language to speak of beauty, peace and transcendence. And, understanding that the work will also have its own voice, he is able to surrender to that voice. There is a sensitivity and reverence to honoring this creative process and the results are compelling, color-drenched compositions with delicious surface texture and lasting allure. Born and raised in New Jersey. Henry graduated from the Art Institute of Pittsburgh, PA in l981. 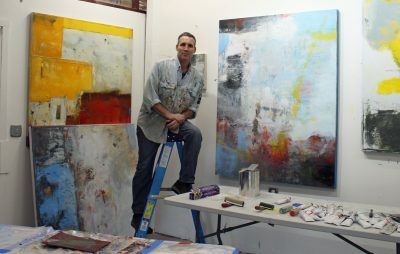 He has exhibited in many solo and group shows in California, and his paintings can be found in private and public collections throughout the US and internationally. He resides in Sonoma County with his wife and two cats.